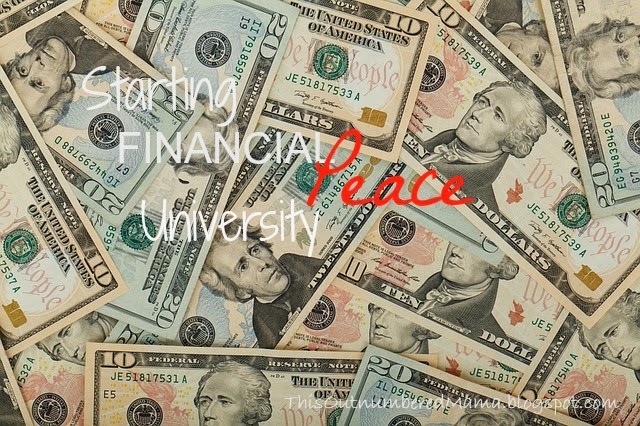 In our church there have been several seasons where “Financial Peace University” was offered in several small groups. Chris and I have always toyed with the idea of going, but there’s a cost to it.. And if it ended up not working for us, then we would have wasted our money. That was not going to cause us financial peace! Luckily, our sweet friends who have done the course recommended it to us, and we were able to borrow the dvds from another friend who had lead the course before. So we get to go through the course on our own schedule while having just a few couples that we trust to help guide us and give us accountability! Now a little history on me. I’m a bit budget obsessed. I LOVE spreadsheets and pretty evenly balanced budgets. Unfortunately, I don’t really like to stick with them once it goes from a nice pretty spreadsheet and starts to get messy… I don’t like tracking my expenses because, it was only ten dollars.. It doesn’t REALLY add up to that much. Except it does. Hmph. We also learned that Chris and I need to take this journey together. If I just give him a spreadsheet and say “You can only spend x amount every month” then it becomes restrictive and a dictatorship rather than a partnership. So, together, Chris and I snuggled up last night to watch the first DVD session, and we started looking realistically at where we stand. Is that frightening for anyone else or just me?? When you first are starting out it seems daunting! Dave Ramsey teaches about the debt snowball, but I’m thinking mine will be more like a debt avalanche! But it’s also really empowering. Overall, it is a number. It doesn’t define me. It doesn’t determine my worth. It is simply a number that we need to chip away at little by little in order to live the life that God has planned for us. We can’t be very charitable if we can’t pay our bills. We can’t give generously when we have nothing to give.